From 1800-1850 Germans (or more accurately, Central European German-speakers, as a German state wasn't founded until 1871), were the main Jewish immigration. Typically young persons fleeing economic hardship and government restrictions, including limitations on their ability to marry, they soon became an integral part of the developing Midwest. What about Yiddish? Forty years after their arrival, now prosperous and highly assimilated "German Jews" might look askance at Yiddish-speaking immigrants from Russia-Poland. It is, therefore, worth noting that the Alsbacher Testament, the document that Cleveland's first party of Jewish immigrants brought with them, which is often shown with its ethical imperative not to lose one's ancient faith in this new country, was written in Hebrew and German, and also written in a third language. Because many could not read German or, other than reading prayers, did not know Hebrew, the testament was also written in Judeo-German (Yiddish) so all could understand it. Once here, we know of no use of Yiddish. Sermons would be in German. Synagogue minutes were written in German. And when Yetta Alsbacher, the widow of Moses Alsbacher, spoke with her lawyer, approving that all her estate (except $5) go to her daughter, we know that they conversed in German. 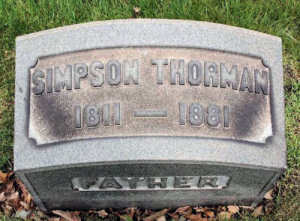 Born in Unsleben Bavaria, Simpson Thorman was Cleveland's first permanent Jewish settler. His encouragement brought 19 more settlers from Unsleben to America in 1839. Thorman literally met the boat in New York and brought 15 of them to Cleveland. Almost overnight Cleveland had a Jewish community. Many of Thorman's descendants (he and his wife had ten children who survived infancy) have played key roles in Cleveland's economic and cultural life and in our Jewish community. Simpson Thorman, born in Unsleben, Bavaria in 1811, came to the U.S. by the late 1820s, passed through Cleveland in 1832, then went to Missouri where he was a trapper. He returned to Cleveland in 1837, settling in the Flats, starting a hide and fur business, and encouraging friends in Unsleben to come to Cleveland. He was a founder of the city's first Jewish congregation (Israelitic Society), an incorporator of its first Jewish cemetery (Willet Street), first president of its first B'nai B'rith chapter, and the first Jew to serve on the Cleveland City Council. Regina Klein, born Reichel (Rachel) in Unsleben in 1816, was in the group that came to Cleveland from Unsleben in 1839. She married Simpson Thorman the following year. Simpson and Regina Thorman had 11 children: Samuel (the first Jewish child born in Cleveland), Esther, Elizabeth (Lizzie) next page, Laura, Rebecca, Fanny, Abraham, Judy, Frank, Simon, and a son who died in infancy. Simpson died in 1881, Regina in 1885. Originally buried in Willet Street Cemetery. their graves have been moved to Mayfield Cemetery. 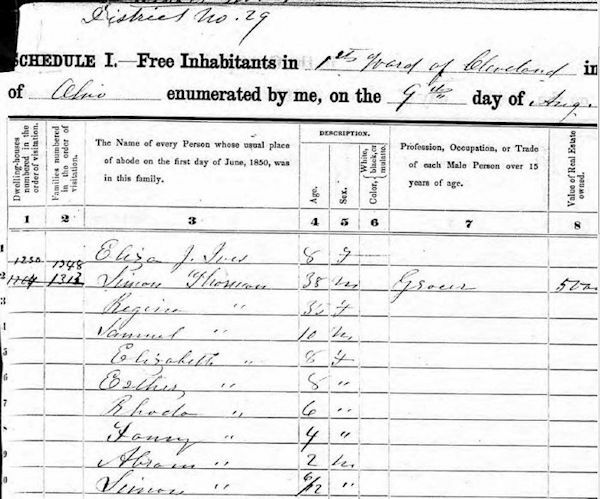 Below The first Federal census that records the Thorman family, August 9, 1850. Martha Joseph married Frank Joseph in 1938.